Electric scooters for sharing lay on the sidewalk outside a subway station in Paris, Thursday, March 21, 2019. 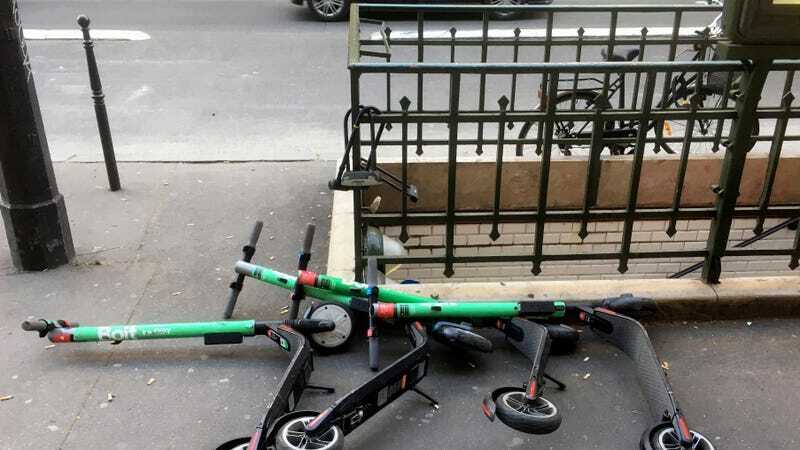 According to WBUR, the incident occurred roughly 15 minutes into an event kicking off Brookline’s pilot program, which is bringing roughly 200 Bird and Lime e-scooters to the town’s streets this week. 62-year-old Kim Smith reportedly lost her balance before tumbling to the ground, but was thankfully wearing a helmet at the time of her crash, as is required by state law. As previously stated, Massachusetts requires scooter riders to wear helmets, which is more than can be said for other states like California. But considering the fact that people are getting seriously hurt on these things—one man who wasn’t wearing a helmet died of head injuries after crashing a Lime e-scooter last year—it’s probably best to opt for one even where they’re not required. This is especially true given that one study found serious scooter injuries often involve head trauma. Correction: A previous version of this story incorrectly identified the scooters in the top image as Lime scooters. In reality, they are Bolt scooters. We regret the error.